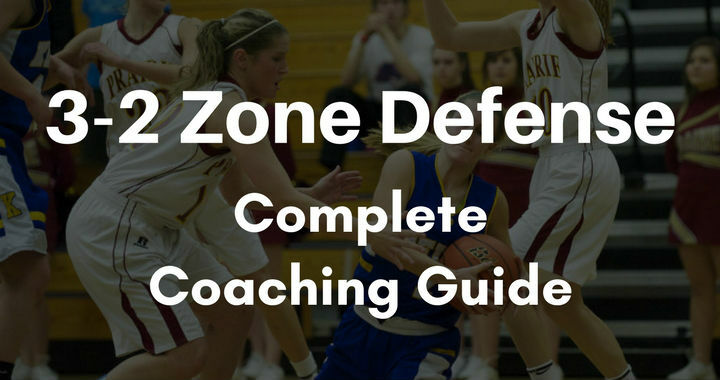 The 3-2 zone defense is a disruptive half-court zone that forces the opposition out of their regular offensive structure and set plays. The main reason for this is that the 3-2 zone hard denies the wings from the top of the key and forces the opposition to initiate offense with a skip pass to the corner or to play through the mid-range. What might surprise some coaches is that the 3-2 zone defense (if ran correctly) is fantastic at locking down the key but poor at challenging teams with great outside shooters. This is due to the lack of pressure at the top of the key and also the difficulty this defense has when defending dribble penetration. Tough to 'figure out' - The 3-2 zone defense denies the wing and forces the opponent to play through the elbows. This will take them out of their usual sets and force them to play an offense they're not used to. Great for guarding the high post - By playing off the opponent at the top of the key, the 'rover' does a great job of denying the high post and won't get caught out of position often. Great for guarding the low post - When the basketball is on the wing, the low post players always front any opponent in the low post. This means the basketball is really passed there for a post up opportunity. Strong rebounding zone - The 3-2 zone defense is a great rebounding defense as the two low post players and the rover are usually perfectly set up in a rebounding triangle whenever a shot is taken. No pressure at the top of the key - If you're competing against a team with players who can knock down the three-point shot at the top of the key, you can't keep your 'rover' on the free-throw line denying the high post. Penetration and rotation - With only two players at the bottom of the zone, I've found defending penetration and players making the correct rotations difficult out of a 3-2 zone. Especially to the corners. Tough to guard great shooting teams - Due to the tough rotations and lack of pressure at the top of the key mentioned above, this defense can lead to the opposition getting open shots from the perimeter. When most people think about implementing a 3-2 zone, they're actually thinking about the 1-2-2 zone defense. These two zones are very different with the main difference being how the two defenses focus on guarding the high post position. The traditional 3-2 zone defense involves three players set up across the free-throw line with the two wings hard denying their opponents on the wing and the middle player (who we call the 'rover') denying the high post. This leaves the point guard at the top of the key without ball pressure. In the 1-2-2 zone, the middle player at the top is pressuring the basketball and the two wing players pinch in to prevent a pass to the high post. This allows the opposition to make a clear pass to the wing which is the main difference between the 1-2-2 zone and a 3-2 zone. The player in the middle on the top line is called the 'Rover' and is usually the small-forward. In a perfect world, this player should be long and athletic. Their main responsibilities involve keeping the basketball out of the high post, picking off passes lobbed out of traps, and crashing the glass to help out the two low post players. The players on the outside of the top line are called the 'wings'. These players are usually the point guard and shooting guard of the team. Their main responsibilities involve trapping in the corner, defending the wing, and playing help defense inside the key. The two players at the bottom of the zone are called the 'posts'. These players are usually the two tallest on the team and cover the power forward and center positions. Their main responsibilities involve challenging shots inside the key, defending the corners, and rebounding the basketball. One of the biggest weaknesses of the 3-2 zone defense is that players don't guard the basketball at the top of the key. That's why it's important you're not running this defense against a team that can knock down this shot consistently. When the basketball is at the top, the rover is required to position themselves on the free-throw line with their arms out wide denying any pass to the high post area. The two wing players are in full denial against their opponents on the wings. We never want to allow a simple pass to the wing. Instead, we're forcing the opposition to play through the elbows. And the two post players are located on their respective low block ready to react if there's a drive inside the key or a skip pass to the corner. When the basketball does arrive on the wing, the wing defender on that side of the court will pressure the basketball. The rover immediately slides across and continues to deny any pass inside to the high post. The weak-side wing will drop into the key and prevent any of the opposition players from flashing to the middle of the key to receive a pass inside. The strong-side post will step across and establish front position if there is an opposition player attempting to post up. Getting front position is crucial because this player is responsible for guarding the corner. The weak-side post slides across to the middle of the key to prevent any lob passes over the other post player. If the basketball is passed to the corner, the strong-side low post must step out to take away the open shot and pressure the basketball. The weak-side post player steps across and establishes position near the ball-side low block. If there is an opposition player posting up, they must play defense from behind. The weak-side wing will take an extra step towards the basket (where they are exactly depends on the position of the weak-side post player) and will prevent any passes to players cutting to the middle of the key. The rover also takes a step towards the basketball and their main role continues to be preventing any pass to the high post. This involves the wing player dropping into the midrange area leaving the reverse pass to the wing open. Coaches should do this if they want to prevent dribble penetration and also put more pressure on the pass into the low post. Getting your wing player to hard deny the reverse pass is another option from the corner. If you choose to use this option, you force the opponent in the corner to make a very difficult skip pass or attempt to penetrate using the dribble. If the 3-2 zone defense is executed correctly, the only time the opposition should get a post up opportunity is off a pass from the corner or possibly the wing. The weak-side post player will defend the low post one-on-one from behind. The weak-side wing player must immediately drop to help defense position. They're responsible for preventing any passes to cutters inside the key and also for closing out on the basketball if a skip pass is thrown. The rover drops to the middle of the key to prevent passes inside and also to defend the high post area. If you don't think the opposition post is capable of scoring one-on-one from a post up, hard deny the passes to the wing and the corner. In this variation, the player defending the corner (strongside post) digs at the basketball to force the opposition to pass the basketball outside. Since the high post is a vulnerable position in the 3-2 zone defense, the defenses #1 goal when the basketball enters this area is to force the opposition to pass out. The rover will always be the defender to guard the basketball in this position. This requires them to establish position between the opponent and the basketball on the flight of the pass into the high post. The two post players will immediately pinch in to prevent any passes inside the key or close to the low blocks. Finally, we want both wing defenders to drop to the midrange area in the middle of the high post and the corner. This will prevent any direct passes to the corners while also positioning the defenders to quickly closeout on any pass to the wing. As usual in the 3-2 zone defense, we choose to leave the top of the key open. By far the best place to trap when running the 3-2 zone is in the corners. Because the rotations are simple and there is very little risk that this trap will lead to an easy layup opportunity for the opposition. 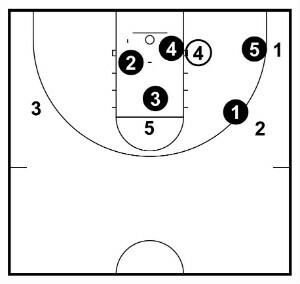 When the basketball is passed to the corner, the strong-side post will closeout on the basketball as usual. When trapping, the strong-side wing will also sprint and closeout on the basketball with high hands. Both players making sure not to foul the opposition player by reaching in. The goal is to deflect a pass or force the opponent to make a lob pass that can be picked off by a teammate. The weak-side post player should already be defending the ball-side low post. If there's an opposition player in the post, ensuring they play behind unless an easy steal opportunity arises. The weak-side wing drops and is responsible for picking off or closing out on any lob passes thrown across court. Finally, the Rover is in charge of reading the eyes of the player with the basketball and covering the outlet pass to the wing as well as the high post. While running the 3-2 zone defense, we want to prevent any dribble penetration as much as possible. Playing only two defenders along the bottom line of the zone can make helping and rotating very difficult for this defense. If an offensive player is able to split between the rover and a wing defender to attack the key, you must help by stepping up the ball-side low post. When this happens, it's imperative that the ball-side wing defender drops down and takes away the corner three-point shot. This is one of the reasons why the drive-and-kick can be devastating against the 3-2 zone defense. If the pass is made to the corner, the wing defender should close out close on the high side of the opponent to force them baseline and prevent an easy pass to the wing. The weak-side low post role is to clog up the middle of the key. When penetration occurs it's common for the player in the high post to dive or for there to be offensive players waiting to receive a pass along the baseline. 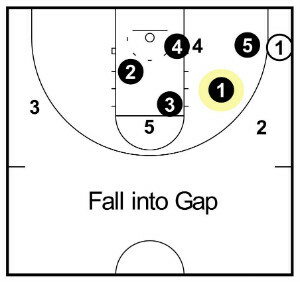 The weak-side post must be there to prevent these easy scores in the paint. The weak-side wing also drops down and is ready to close out on any skip pass made to the opposite corner or wing. Finally, the rover will usually be on the ball-handler's hip at this point as it was their role to keep them out of the paint. They trap the basketball with the post player who helped keeping their hands high and attempting to force the offensive player to pass back out to the top of the key. If an offensive player penetrates below the wing defender, the ball-side low post must step up to help. Since the low post defender should be on the block, we aim to impede and stop this dribble penetration a couple of feet outside the paint. When this happens, you'll find the offense will often have the opportunity to pass to the corner for an open three-point attempt. That's why it's crucially important that the low post defender helps from the low side and is ready to sprint out and challenge the corner three-pointer. The weak-side low post clogs up the middle of the paint and prevents any easy scores around the basket. The rover also drops to the middle of the key to take up space and prevent any pass to an opponent diving to the rim off the high post. And the weak-side wing drops to outside of the lane line and is ready to close out on any skip passes made from the corner to the wing. The final dribble penetration to mention is the baseline drive. When an opponent attacks between the baseline and the low post defender. First, this should never happen. The low post defender should be closing out to the corner by forcing their opponent towards the middle of the key. The weak-side low post must step across and trap the basketball with the other post defender just outside the paint. The rover immediately drops down to the middle of the key to prevent any passes inside and deny any opponent diving from the high post. The weak-side wing also drops to the key and is ready to close out on any skip pass made to the opposite corner or wing. The ball-side wing also drops towards the basket and is ready to close out on any reverse passes made to the same side of the court. Skip passes are a fantastic way to shift and confuse the defenders when attacking a zone defense. That's why it's incredibly important that your players understand the correct movements and rotations when you're teaching a zone defense. Here are the most common skip passes and how to defend them. On any skip pass made across the court to the corner, the weak-side wing defender must close out on the basketball before being 'bumped' off by the low post defender. The reason for this is because it's too far for the weak-side low post defender to close out as they will currently be on split-line or behind an opponent in the low post when the pass is thrown. The weak-side wing defender closes out on the high side to prevent a quick pass to the wing and also to direct the opponent towards the low post defender who will be closing out. This can result in a great trapping opportunity. If you choose to not trap in the corner, when the low post defender arrives the wing defender is bumped back to their position on the wing. When the skip pass is made to the wing from the opposite corner or wing, it's the weak-side wing player who must close out once again. There are no fancy actions or complex rotations required by the defense on this pass, the most important thing is that everyone changes sides of the court as quickly as possible. The low post must sprint across to take away the corner three-point shot, the rover must switch denial positions on the air time of the pass, and the two other defenders must establish help position as soon as possible. The other pass worth mentioning is the skip pass from the top of the key to either of the corners. When you run a 3-2 zone defense, a lot of teams will attempt to screen the outside of the low post defenders to create open shots in the corner. That's why it's crucial that your low post defenders are always fighting for position and ensuring they have a clear path to the corner when the basketball is at the top of the key. When this pass is made, the ball-side low post closes out on the basketball (forcing middle) to prevent the corner three-pointer while the weak-side low post immediately establishes help position on the ball-side low block. Most coaches and players don't realise this, but the 3-2 zone defense puts teams in great positions to rebound at a high level. Regardless of where the shot is taken from the perimeter, a 'rebounding triangle' is always formed which places players in ideal positions. The weak-side low post covers ball-side low. The rover covers the top. The weak-side wing covers weak-side low. When a shot is taken from the wing, the will still be three defenders forming a rebounding triangle but they will have the additional help of the strong-side post player. The ball-side low post battles for front position to help the other rebounders. The two low post players take the low position on their side. The biggest benefit of the traditional 3-2 zone defense is that it will force the opposition out of their regular offense and force them to create a new game-plan. This is very similar to the disruptive nature of the 1-3-1 zone defense (In fact, these two defenses are very similar when you dig down into the details). Don't overlook how beneficial this is to your team. Also, if you're competing against teams with poor outside shooting ability, this is a great zone to lock down the paint and ensure they don't get easy shots inside. Just make sure your team is able to stop dribble penetration!